Perhaps you live in a cold climate where outdoor grilling is limited to the summer months. Or maybe you prefer the simplicity of grilling your meat indoors. To get backyard flavor all year long, indoor grilling is a convenient alternative. However, you must use a grill that is designed specifically for indoor use. Do Not use your outdoor grill inside! Outdoor grills produce carbon monoxide, a substance that can kill you if these grills are used indoors. Indoor grills are available as countertop appliances or as built-in units for residential or commercial use. Small countertop grills are a nice alternative to an outdoor grill if you want to grill small amounts of food for one or two people — or if you don't want to heat the whole house with the oven or broiler! Countertop grills are manufactured in open grill or contact grill models. Open grills have a single, large grid, and can grill larger quantities of food at one time. Contact grills cook faster, because the grids touch both sides of the food at once, and they require less counter space. 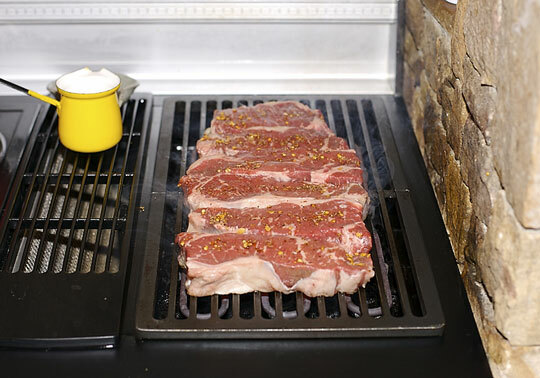 They are often sloped so that excess fat from the grilled meat drips off into a drip pan. An added plus is that many contact grills have interchangeable grids so the appliance can also be used as a griddle or sandwich press. When choosing a countertop grill, consider the size of your cooking area and how much footprint the grill will require. Grills between 1,200 and 1,500 watts will brown best. Many newer models have temperature controls to help regulate the heat. 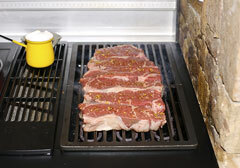 Closely-spaced grilling ridges on the grids will contact the food better and make it crisper. Grills with adjustable hinges will grill foods of varied thicknesses more evenly. And, of course, non-stick surfaces help with the cleanup. Permanently installed indoor grills can be gas or electric. Many of these units are available for modular cooktops. The flavor of foods cooked on indoor gas grills will taste closer to foods cooked on an outdoor grill. With these built-in grills, smoke must be removed from the grilling area, so make sure your grill is vented. Watch for flare-ups from dripping fat, don't leave the room while the grill is on, and keep a fire extinguisher handy. Professional indoor grills cook at a higher heat than grills designed for residential kitchens, and they are much more expensive. Large, professional grills require special venting, fire suppression systems, and surrounding areas protected with fireproof materials such as ceramic tile or stainless steel. George Foreman Grills offers a series of indoor and outdoor grills. Cuisinart offers contact grills that can also be used as griddles or panini presses. Thermador manufactures gas ranges with griddles and optional grill accessories. 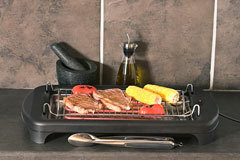 Viking offers a reversible grill/griddle accessory for their professional-grade cooktops and ranges. Jennair features downdraft ranges and cooktops with modular grills. 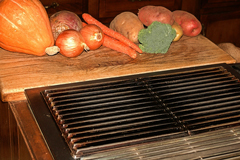 Whirlpool offers an optional gas grill module for their ranges and cooktops. Subzero/Wolf offers an integrated cooktop with an electric grill module.